October is ADHD Awareness Month and one week in October is ADHD Awareness Week each year. There is more to ADHD than just the hyperactivity aspect and symptoms can show in different ways. How much do you REALLY know about ADHD? Are you SURE you know the symptoms and facts about ADHD? I thought I knew all about it till I checked out the infographic below. The ADHD Awareness Week website has lots of resources on ADD and ADHD if you want to know more. The ADHD Awareness Month website has a self-screener for adults. If you are wondering if you might have ADHD it might help. Canada loses an estimated $6 billion to $11 billion annually through loss of workplace productivity. The Canadian cost of illness extrapolated at over $7 billion, exceeds the cost of major depressive disorders. 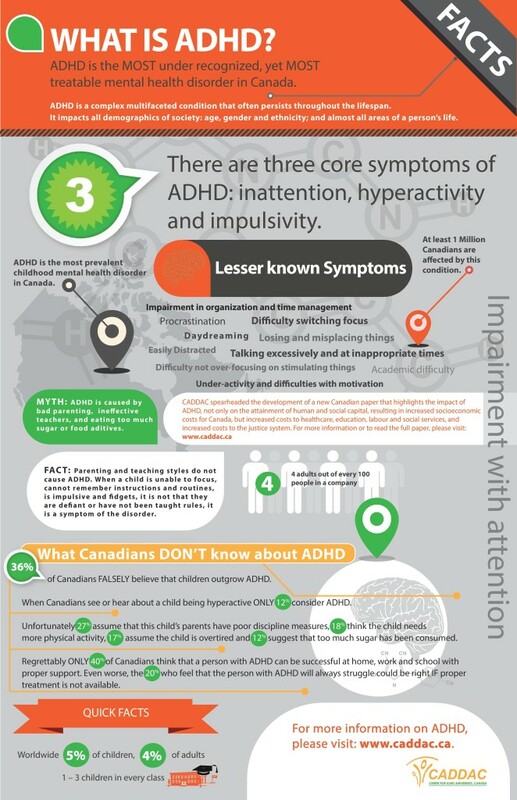 Individuals with ADHD are more likely to enter the workforce as unskilled or semi-skilled workers; have greater periods of unemployment; change jobs more frequently; and earn considerably less money over their lifetime. The following are affiliate links. If you make a purchase through these links I make a small commission.